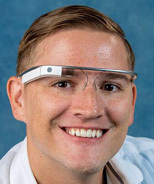 Google Glass is the first large-scale effort to bring optical wearable computers to the marketplace. It's unlikely to be the last. Glass is a head-mounted display with many of the features of a smartphone (view screen, audio, microphone, camera, geolocation, touch interfaces, and runs the Android operating system). Glass has been designed from the ground up with two development kit options: the Mirror API for web service-based development, and the GDK (Glass Development Kit) which is a small superset of the standard Android Development Kit. The good news is, any developer with experience programming web services or smartphone applications need only make a short leap in their XU (user experience) sensibilities, and a few new tools, to program Google Glass. Eric Redmond has worked with Fortune 500 companies, governments, many start-ups, and is currently a distributed systems engineer at Basho. He is a programmer, illustrator, international speaker, Glass Explorer, and founder of Google Glass & Wearables in Portland. You can follow Eric on Twitter @coderoshi.